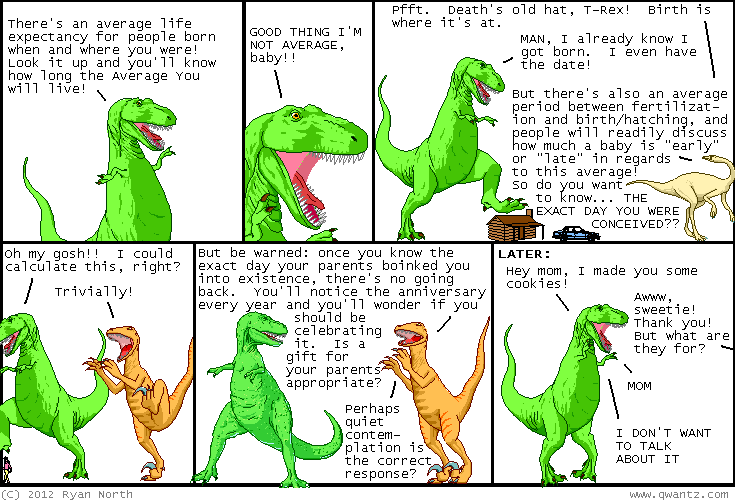 Dinosaur Comics - December 11th, 2012 - awesome fun times! –No wait, Batman riding a pterodactyl! Today's the shipping deadline for several classes of shipping! If you want some totes amazing things to arrive in time for Christmas, you need to get ON this, STAT. There's a new A Lesson Is Learned But The Damage Is Irreversible! The first one in FIVE YEARS; go read this and I PROMISE you will not be disappointed! One year ago today: i considered "Linear Holographic Russian Nesting Dolls", but the Matryoshka dolls already imply linearity in exactly the same way as the word, so we are SET. thanks, craftspeople beginning in historical times!